The planet Mercury's 'pencil lead' surface has been revealed at last. You might be surprised to hear that the closest planet to the sun has an immensely dark surface. For a long time, Mercury’s lack of sunlight left scientists puzzled. The planet’s surface isn’t littered with iron-rich materials, known to be a darkening agent. So just what makes Mercury so dim? A new study from Johns Hopkins University claims the answer is carbon. The element has ancient origins from deep within the planet itself. Patrick Peplowski, of the Johns Hopkins University Applied Physics Laboratory, and his team used data from the MESSENGER mission to study the accumulation of carbon on Mercury. Prior to these studies, scientists proposed that the carbon came from comets that traveled into the inner Solar System. Poplowski’s team came to a different conclusion. Rather than being delivered by comets, the carbon most likely originated deep below the surface, in the form of a now-disrupted and buried ancient graphite-rich crust, some of which was later brought to the surface by impact processes after most of Mercury’s current crust had formed. MESSENGER obtained its statistically robust data via many orbits during its last year of operation. Repeated Neutron Spectrometer measurements showed higher amounts of low-energy neutrons, a signature consistent with the presence of elevated carbon, coming from the surface when the spacecraft passed over concentrations of the darkest material. Figuring out exactly how much carbon was present required combining the neutron measurements with other MESSENGER datasets, including X-ray measurements and reflectance spectra. Together, the data indicate that Mercury’s surface rocks are made up of as much as a few weight percent graphitic carbon, much higher than on other planets. Graphite has the best fit to the reflectance spectra, at visible wavelengths, and the likely conditions that produced the material. When Mercury was in its infancy, much of the planet most likely consisted of an “ocean” of molten magma. Scientists believe that, as this magma cooled, most minerals that solidified would sink. Graphite though, would have been buoyant and floated to form the original crust of Mercury. 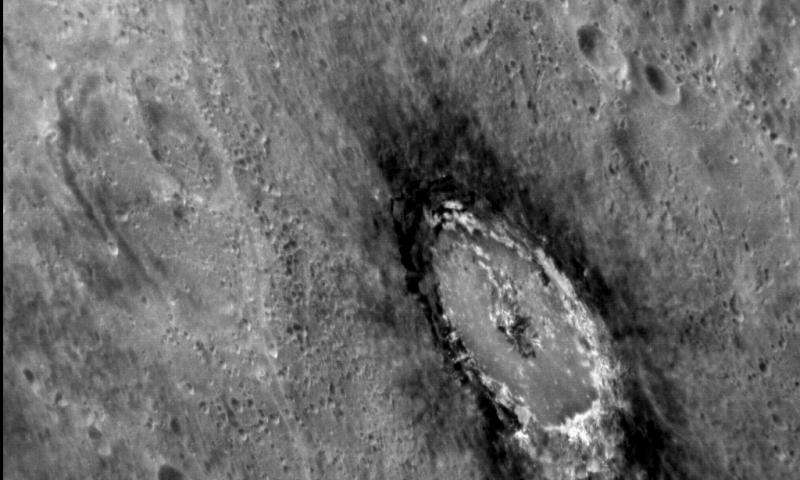 “The finding of abundant carbon on the surface suggests that we may be seeing remnants of Mercury’s original ancient crust mixed into the volcanic rocks and impact ejecta that form the surface we see today. This result is a testament to the phenomenal success of the MESSENGER mission and adds to a long list of ways the innermost planet differs from its planetary neighbors and provides additional clues to the origin and early evolution of the inner Solar System,” concluded Nittler.